The landscapes of Kullu and the serenity that fills the ambience created by enchanting Himalayas, Pine and Oak forests, and hot springs makes for a peaceful getaway in the abode of Maha Devi. The air filled with piety - a lingering sensation in the broad open valley of Kullu extends an invitation to the devotees of Devi Shakti who is believed to be residing in a cave. Mahadevi Tirth Temple, located just 2 Km from Kullu Valley on Kullu - Manali road is believed to be Vaishno Devi temple in Kullu. Although the cave is newly found, devotees throng here inspired by their faith of its age old existence, hidden by Natural Forces. The foundation of the tirth was laid down by Swami Sewak Das ji who was a great worshipper of the Goddess. Believers follow the person who was instrumental in locating and enshrining the place which now provides 'Trimurti Darshana'. Swami Sewak Ji reached Kullu in 1962 inspired by his intuition and guided by an inner voice. Having reached to the place he had to face disappointment for not being able to locate the shrine. Returning did not do any good because he was sure of what he felt and thus went again. Then only he found the cave hidden by a huge stone and course of water. He worked hard to unveil the place and make it easier for devotees to come here and pay a visit to the Mother Goddess. Bijli Mahadev: One of the temples popular around Kullu Valley, it is a fine example of art of sculpting. Dedicate to Lord Shiva, the divine place is enveloped in the beauty peculiar to hills. This temple is the highest point in the Valley from where a panoramic view of the valley is eye-catching. Raghunath Temple: More often than not, sin paves the path for attainment of salvation. 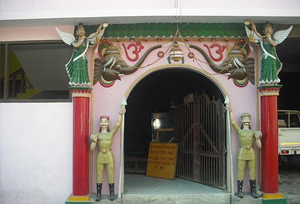 The existence of this temple is one such example. When Raja Jagat Singh of Kullu realized the need for penance for committing a great mistake, he fetched an idol of Lord Ram from Ayodhya and laid the foundation of this temple in 17th century. By Air: Kullu is just 10 Km away from Bhuntar Airport (also known as 'Kullu Manali' Airport) located in south. Chandigarh happens to be the nearest airport serving longer route flights. By Rail: Nearest railway stations are Chandigarh for broad gauge and Joginder Nagar for narrow gauge. After deboarding however, need to take bus / car / taxi stands, which is not much of the problem. By Road: Delhi - Chandigarh - Kullu is often the route taken to reach Kullu, crossing known towns like Bilaspur, Mandi, etc.